Think about the good things associated with marriage and life after marriage. Write your fears on a piece of paper and read them to yourself. You will find that most of the fears are baseless which will help you calm yourself down. Take a break from the wedding preparations and go out with friends. It would be wise to talk to other married couples and their experiences after marriage. You can even take professional help from therapists and counselors who can allay your fears and nervousness. They are experienced in such cases and may suggest techniques that may help you relax. Think about the happy moments of your relationship like the first date, the time you spent together, about the proposal etc. In case your partner is the one with the jitters, it is important that you have open talks and share the fears. 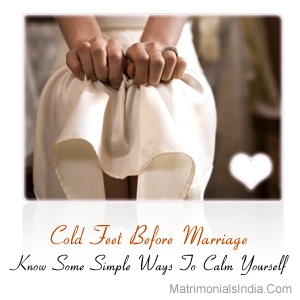 Marriage is a joyful occasion and a cool head with clarity in mind will ensure that you stay carefree on the wedding day.